Steven (Chicagoland, United States) on 19 April 2011 in Animal & Insect and Portfolio. A gopher tortoise spotted at Bowditch Point Regional Park at the northern tip of Estero Island in the Town of Fort Myers Beach, Florida. I came across this tortoise by accident, almost stepping on it. The gopher tortoise is a land tortoise that excavates burrows, like the one seen here. 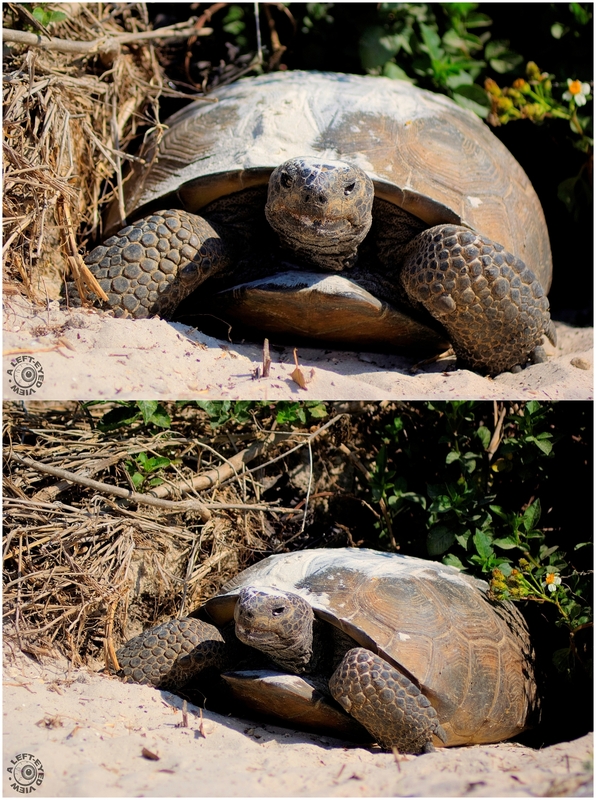 The gopher tortoise is a land animal and is not adapted to living in the water. The State of Florida, due to habitat loss, designated gopher tortoises as a species of special concern. Photo captured March 22, 2011. He's quite a specimen, looks large too. Hello ! Brilliant idea for this presentation. Great details. timeless, ageless, almost out-of-this-world, and certaily worthy of protection! Great shot! Almost looks pre-historic. Great portraits. Those are big guys! Do not know why you did collage. First image is good enough to be alone . @MARIANA: Two days of the same subject usually doesn't garner much response from fellow photographers on the second day. While I loved the close-up of the tortoise's face, I also admired the better "reveal" of the tortoise's shell and its patterns in the second shot.